Tuesday evening, November 27 Father Vasyl Vladyka and his family, while in the parish rectory suddenly smelled smoke as if something was burning. Going up to the second floor of the rectory, they looked out the window and saw flames coming from the right side of the church. This is how Father Vasyl and his family were suddenly confronted with the reality that the church in which he celebrated countless Divine Liturgies, welcomed new parishioners with the mysteries of initiation, married couples in the mystery of crowning, heard penitents seek forgiveness through the mystery of reconcilation and escorted the faihtful called home to the Lord on their final earthly journey, was succombing to the destructive flames of a three alarm fire while they could only watch in horrified shock. St. Mary's Ukrainian Catholic Church, a landmark on Roosevelt Avenue since it was built by Ukrainian Catholics in this Middlesex County, New Jersey community in 1954 was being destroyed by a three alarm fire that sent tongues of flame into the night sky while smoke billowed out of the broken spaces that once were beautiful stained glass windows and the holes in the roof made by the firemen to gain control of the conflagration. Fortunately, no one was injured by the blaze but the house of worship was been termed a total loss. The church was deemed a total loss, officials said. Wednesday, Bishop Andriy Rabiy, apostolic administrator of the Ukrainian Cathoic Archeparchy of Philadelphia, immediately traveled to Carteret to meet with Father Vasyl Vladyka, to offer his support at this time and to assess first hand the damage that the blaze had done to the 64 year old church, to assess the immediate needs to start having services and to help find a new place of worship until the decision is made whether the church can be is renovated or a new church built. 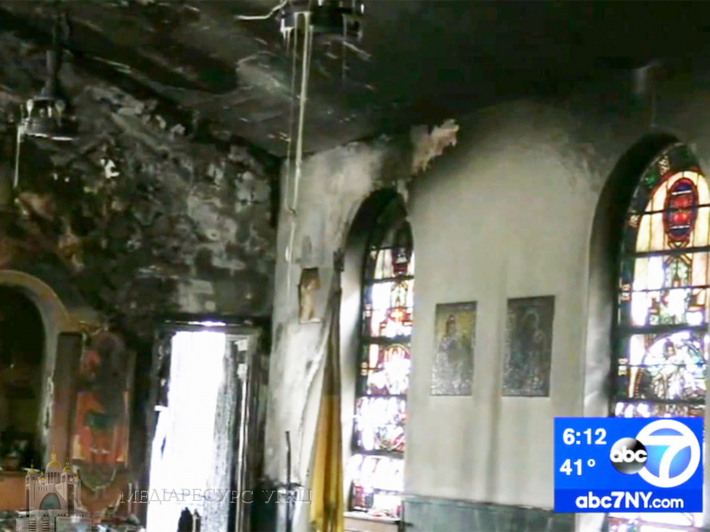 Bishop Andriy commented, "They lost lost everything - vestments, prayer books, icons, chalices...everything except their faith!" 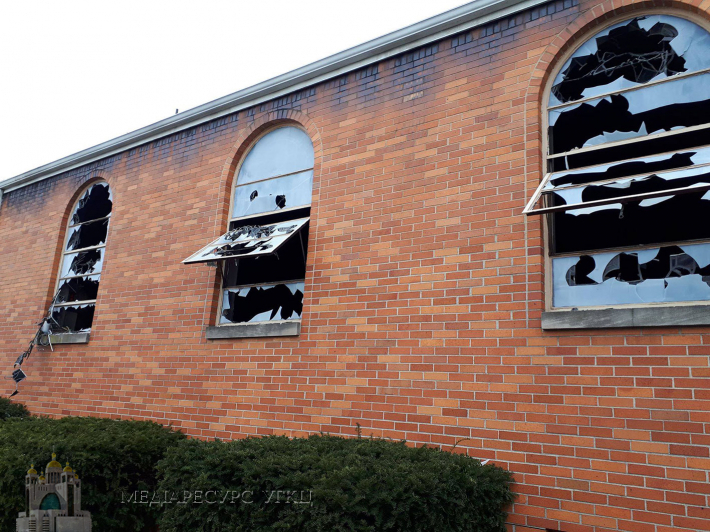 Already several churches in the area have offered their churches as a temporary home where St. Mary's congregation will be able to continue worshipping as a parish community. Throughtout the day on Wednesday, parishioners and neighbors stopped by to see the tragic image of the once beautiful edifice now scarred with smoke stains, smashed stained glass windows and the smell of charred wood that hovered over the area. Carteret Mayor Daniel Reiman was present to lend his support, and immediately included on the Carteret Official Website a picture of St. Mary's and informed residents that donations to help support the church will be accepted at the Carteret Business Partnership. 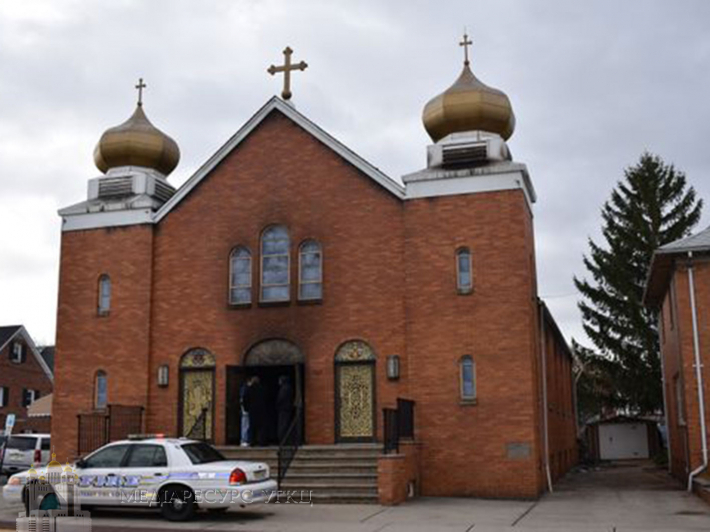 Bishop Andriy has asked all parishes to take up a special collection for St. Mary's Fire Fund at all Divine Liturgies the weekend of December 8 and 9. In this season of giving he asks all to be generous at this time to help their brothers and sisters in Christ in Carteret who are now coping with this tragedy and the loss of their spiritual home. Bishop Andriy also asks that you please kindly remember Father Vasyl Vladyka, his family and parishioners of St. Mary's in your prayers.